Go Stop Traffic Lights Arcade Machine is an exciting puzzle game from Andamrio. Go Stop is an easy and intuitive ticket redemption game for all ages with a simple traffic light concept. Players simply press the button to stop the moving light at the desired traffic light. 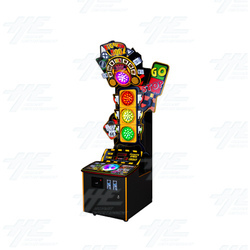 The Go Stop Traffic Lights Arcade Machine is a vibrant looking machine, making it suitable for any location. The charismatic large traffic lights amplify the excitement of a playerand the three games in triangular format make it a perfect centepiece for any collection. How to play: - Match the Green light to the correct position. - Match the Yellow light then Red light to complete the traffic lights. - Now challenge the Boss and win big. - Match the moving light to "BIG" and score BIG. The Go Stop Traffic Lights Arcade Machine is a vibrant looking machine, making it suitable for any location. The charismatic large traffic lights amplify the excitement of a playerand the three games in triangular format make it a perfect centepiece for any collection. Match the Green light to the correct position. Match the Yellow light then Red light to complete the traffic lights. Now challenge the Boss and win big. Match the moving light to "BIG" and score BIG.